If you're looking for a simple sofa that won't break the bank, check out the Siro range at LXdirect. It's not a shop you'd normally think of for stylish products for your home, and agreed, much of the stuff in their sale isn't of particular note, but this range with its clean, simple lines caught my eye. 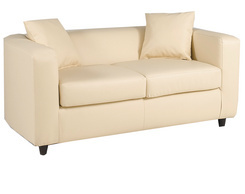 Available are two-seater, three-seater and corner units in tan, chocolate, black and cream faux leather at discounts ranging from 40% to 55% for the smaller sofa shown in cream which is £250, down from £550.